From 4 Foot, 11 Inches... To 3 Inch Scale! One of the most exciting aspects of this project, is the work that goes into the creation of every Gran'pa pose. The 3D printing medium is a very new technology, and a crucial factor in getting real-life Gran'pa to look identical to his miniature avatar replicas. Every single pose of Gran'pa was created based on photos from the real man. 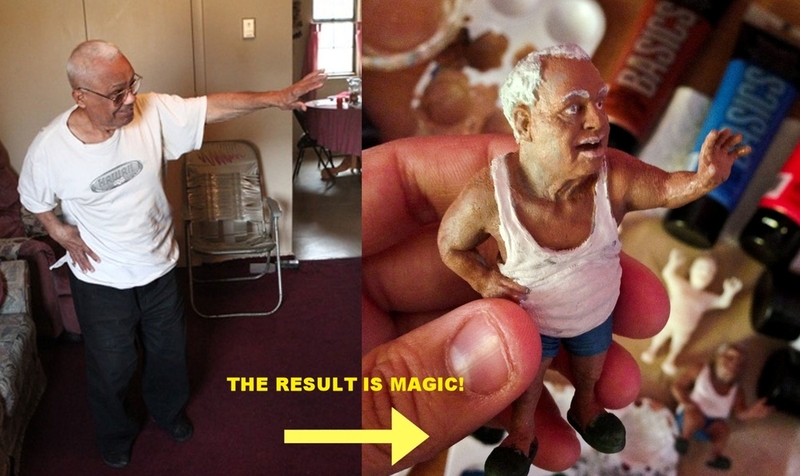 In short, it takes about 10-12 hours of modeling/printing/hand-painting in order to create a single Gran'pa pose. The photos below detail the process. The Gran'pa models are created using the program Zbrush, and then 3D printed on a high quality professional Objet printer. Check out this short video for How you Doin,' Boy? Voicemails from Gran'pa. It details much of the creative process used to bring a single a video to fruition.